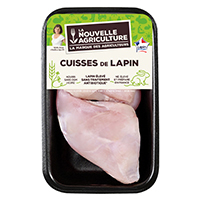 La Nouvelle Agriculture ® products are for consumers who are interested in production methods and animal husbandry. 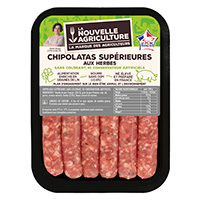 La Nouvelle Agriculture® products guarantee local products from the most natural production methods, at a fair price, with a good taste and bringing Healthy Eating to consumers. Chickens are fed according to the specifications Bleu-Blanc-Coeur which advocates a agriculture for health. Thus, animals are fed with minimum 8% flaxseed, naturally rich in Omega 3. 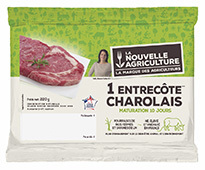 La Nouvelle Agriculture® cattle, of the Charolais breed, are bred in France with a diet based on farm fodder and enriched with flax seeds and plant extracts. This product is the result of 4 years of work between rabbit producers aimed at reducing and then eliminating antibiotics from their production. 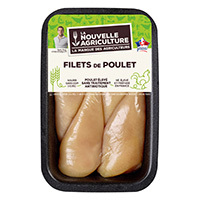 La Nouvelle Agriculture® porks are fed according to the specifications “Bleu-Blanc-Coeur”, a flax-based diet that brings diversity and balance. Well-fed and healthy, they produce quality, tender and tasty meat. From the field to the bakery, farmers and mills are involved to guarantee the regional origin and traceability of La Nouvelle Agriculture® flour. This new farming model puts the farmer in the centre and guarantees to the consumer a local product from natural production methods, with an accessible price and high-quality gustative qualities.